Attraction Marketing - Is This For Real? Attraction Marketing – Is This For Real? Several months ago out of pure frustration and on a whim, I took the red pill and then went down the rabbit hole following it seemingly into an almost parallel universe, a parallel universe of network marketing. Perhaps I should back up and explain here. There was this movie called The Matrix, I am sure you have seen it, and there was a scene in the movie where one of the characters Morpheus offered another of the characters, Neo, two choices or rather two pills. 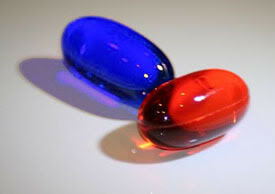 In one hand he held a Blue Pill and told Neo that he could take that one and go on with his life and nothing will have changed, in the other hand he held a Red Pill. He told him if he choose that one, that the illusion of the world would be ripped away and nothing would ever be the same. That’s kind of like what happened to me almost a year ago. I had made the commitment to build a new network marketing company and I was struggling with find a good high volume lead generation strategy and encountering lots of frustration as I kept retooling and trying to adapt older approaches trying to find the magic in the marketplace. You see I have always been a believer in high volume lead generation approaches as the best way to build your network marketing business. If you read “My Story” in www.AskMarcBarrett.com/about then you know that the huge organizations I built and profited from were generated form cold leads, not friends and family. That insight of course did not come right away. When I first entered the network marketing business, even though I had been a successful business person before, I had no clue of how to make it work and I failed miserably for several months and probably quit 5 times in the first 6 months. You know how it is, I got so sick of chasing my warm market around only to hear, I haven’t decided yet Marc, I still looking at several options Marc, follow up with me next week Marc. It drove me nuts. I could see that to be successful in network marketing you needed to be able to develop a large group, but using the approaches I was using, I could see it was not going to work. I knew there had to be a better way. Then the light went on and on day probably after my 50th person said no! I could see the problem was that I was selling the opportunity to a bunch of luke warm prospects who weren’t really interested, and what I needed to do was to start marketing to a much larger audience who were actually looking for what I have to offer. I quickly developed an advertising approach and scaled it up until I was getting 60 to 100 MLM leads a week. Now when you achieve that kind of volume, you are suddenly swimming in prospects and it becomes impossible to follow the normal sales routine of: “Prospect, Present, and Follow Up”. So the normal chasing of prospects that we all are taught to do in sales abruptly stopped. I did group presentations for the prospects, and then sent them out the door and told them they would have to get back to me within 48 hours if they wanted to be on my team. Now believe it or not, I never followed up on anyone. Did the strategy work? well within 2 years I was one of the top producers in my Network Marketing company, had sponsored over 250 dead serious people into the business and was making pretty close to a million dollars a year. Now why did it work? Well the prospects were attracted to me because they saw I had a system that worked, but they also saw that they needed what I had more than I needed them. In short, they were attracted to me. Now the problem that I faced a year ago, was that the network marketing universe changes year by year, and what worked yesterday may not work today. So although some of the marketing systems I developed worked pretty well, there was still something missing. I sensed that there was something just beyond my grasp, kind of like waking up from a dream knowing that you have solved a huge problem only to have it disappear. In those first waking moments you knew that you had the solution, you could feel it with every fiber of your body, but within a few moments it was gone and you could no longer put your finger on it. Well that’s exactly where I was when Joe stopped by my house with a copy of Magnetic Sponsoring, the Attraction Marketing manifesto by industry legend Mike Dillard. Joe was a successful business guy in my MLM downline in Miami, and as he sat down in a chair he dropped the 80 page printed out Magnetic Sponsoring e book in front of me and told me I needed to read it because he was going to do what the book said. Well, that is of course the ultimate challenge, a rebellious MLM downline veering off on some tangent you know nothing about. So I knew I had to read it so I could assure him it was just more crap off of the internet and to stick with the basics. I of course had seen references to this book on Attraction Marketing on the internet for a few years but the name “Magnetic Sponsoring” seemed kind of stupid so I never checked it out. Let’s see, we read this book on Attraction Marketing and all of a sudden people start chasing us down the street begging us to sponsor them…… right! Well I took the book and started reading it, never realizing that I had taken “Neo’s” fated red pill, and my journey down the rabbit hole began. I think I read the entire Attraction Marketing e-book in one sitting, as paragraph after paragraph rolled off the page all I could do was smile and shake my head because it was so right on target it was scary. Then the Ah Ha moments started coming and didn’t stop until the end of the book and then I had to put it down and think about it for a day or so. Now it’s not a training course but rather a philosophy and a marketing strategy that the author Mike Dillard professed would change the way you do the MLM business forever. It outlined the principals of Attraction Marketing, which is a sales approach so subtle yet powerful most people never even realize they are affected by it. It outlined a high volume MLM lead generation approach that used the internet to generate leads for you network marketing business that I could see far surpassed what I had been able to do in the past with newspaper advertising. It employed Attraction Marketing principals to eliminate the chasing of prospects that burns us all out. It also outlined the principal of using what is called “Funded Proposal” marketing which allows you to that generate huge traffic off of the internet, while being able to make money off of that traffic even if they never join your network marketing opportunity. Believe it or not this strategy changes the process of generating MLM leads from an out of pocket experience where you normally pay for advertising and hope for a return, into a cash flow business were you can generate thousands of dollars of income while you generate thousands of MLM leads. Now there are “Point & Click” out of the box internet marketing systems that are based on this same key principal of Attraction Marketing like “My Lead System Pro” that can not only give you the training on how to generate leads on the internet but also already have the “Funded Proposal” affiliate income streams built right into the system so you don’t have to be some tech wizard to use this type of marketing. Well I went down that rabbit hole pretty far and it did change the way I do business dramatically. If you haven’t looked at this remarkable E book, on Attraction Marketing check it out at the link below. Now I warn you, Mike Dillard’s book on Attraction Marketing will challenge you, and it will change many of the ways you currently look at doing the network marketing business. Now of course it’s easier not to change, to stay the same, but something in us is just so curious. And if you were wondering, Neo of course took the red pill. Awesome article, great brief advice on how to learn more on attraction marketing. I read the book Magnetic Sponsoring on numerous occasions and seems like I always learn something new, awesome post by the way.